In 1999 he got a full scholarship to get his Master Degree In Jazz at Berklee College of Music and The Boston Conservatory. His main teachers were Mick Goodrick (Gary Burton Quartet, Pat Metheny), Wayne Krantz (Leni Stern, Steely Dan, Michael Brecker), Hal Crook (duo w/Joe Diorio), Ed Tomassi, Dave Fiucsynski (Screaming Headless Torsos), Rick Peckham, Larry Baione, Charlie Banacos, and the South Indian â€˜guruâ€™ Prasanna. Gustavo also had master-classes/lessons with Pat Metheny, Frank Gambale, Mike Stern, Dave Liebman and John Scofield. 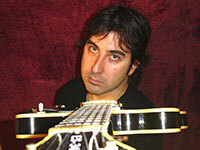 From 2001 until 2006, Gustavo played/toured the renowned group the Dig Trio. He is also the director of the Jazz and Contemporary Music Department of the Cambridge School of Weston and teaches at Berklee College of Musicâ€™s Guitar Sessions. Also as a teacher, Gustavo taught clinics at GIT, Guitar Institute of Technology, Los Angeles, CA; University of Southern California, Los Angeles, CA; Berklee College of Music, Boston, MA; UFRGS, Brazil; Federal University of Santa Maria, Brazil; University of Passo Fundo, Brazil. In 2005, Gustavo released the book Hybrid Picking for Guitar. This book is the first method entirely dedicated to the art of combining pick and fingers to play the guitar. The book is in its 3rd edition and it has been receiving praise worldwide. Gustavo performed/recorded with John Stowell, Steve Trovato, Frank Potenza, Richard Smith, Sandro Albert, Hiromi, Tony Grey (John Mclaughlin), Prasanna, Greg Hopkins, Brett Wilmott, Garo Saraydarian, Tony Gaboury, Matthew Nicholl, Tim Ries (Rolling Stones, Paul Simon, Steve Wonder), Nelson Faria, Renato Pereira (Dione Warwick Band), Jose Pienasola (Elis Regina, Romero Lubambo, Leny Andrade), Marina Elali, Michael Farquharson, Hiroaki Honshuku, Winnie Dahlgren, Doug Johnson, Natalie Dietrich, Fernando Huergo, among others.